Maybe I can fry up small patties and can them in broth is what I am thinking. That would be fine. Meatballs would be good too. Yea, meatloaf is questionable for sure. Interests:Sewing, quilting, gardening, canning, healthy cooking, natural health, herbs, reading, knitting, crocheting, teaching, raising chickens! You are able to can ground beef. The BBB (Ball Blue Book) suggests patties as a means for this. I encourage the use of WIDE MOUTH jars for canning meats, it's just easier to up-end the jar and give it a shake without using a spoon. When I canned the hamburger patties, I made them the size of the bottom of the jar and could fit 3-6 in a wide-mouth pint and 8-10 in a quart jar. I added 1 tsp of salt (for pints, 1 tbsp for qts), filled with water to I think 1/4" (check the BBB) and wiped the rims & band with a paper towel that had vinegar on it. Vinegar cuts oils like nobody's business. I did up a fair amount of these patties. Upon trying them, I was disappointed to find that the pressure canning had changed the texture just slightly. It had more of a...well....texture. I'm not sure how to describe it. I've found that I dont' care for it BUT it certainly beats MRE's in my book! I will eat these when I am extremely tired. I add a mushroom soup for gravy, some instant potatoes and home-canned green beans, maybe some fruit or stewed tomatoes. Dinner in less than 20 minutes! My husband doesn't seem to mind these and doesn't care about the texture. You will notice that after your jars have cooled, the hamburger has a bit more gelatinous 'material' around it than say beef chunks or chicken. It's normal. I just scrape it away. Some people use it in the skillet for re-heating. Thanks for the help CGA. I am still waiting for my new Ball Blue Book to be shipped. Been waiting a month for Amazon to get more in. So, your instructions are perfectly understandable... how many minutes processing for quarts? for pints? I might just make mini patties. The gelatin will heat back up just fine. And yeah, I just want it preserved and handy for consumption. Do i just brown the patties and put in jars with broth? ( then process ) or cook all the way through as patties and then can them? You can use the online methods and recipes from the National Center for Home Food Preservation. You don't need to wait for the Ball Blue Book. The Ball book just has some more recipes, but all the basic, safe methods and recipes come from USDA to begin with. They are the leading authority on home preservation at the Univ. of Georgia. You want to get as much oil off the meat as you can, so I pat them dry with a tea towel once they come out of the pan. If I have a surplus of paper towels I will use them, but last time I did, I ran through almost an entire roll! You can add broth, but remember that you will get a darker liquid surrounding the patties. I prefer the water because I can tell easier if spoilage happens. You will want to add salt, though, because remember that you are pre-cooking (searing the beef). Sometimes I've found that you just can't get it to taste right as you're cooking it if you don't add salt when processing. When doing a RAW pack of poultry, I don't add any liquid of any sort, I just let the meat cook in its own juices. Have fun! Do let us know how it goes! And - check out that national website! OK, got the weighted gauge on , but it only had two ring weights, so only one for under 1000 ft, to be for 10 lbs pressure?????? Anyone know? Ready to can now! I believe that is correct, Arby. I've only ever used the weighted gauge in class, though. I perfer the gauge canners, myself. Give a shout in the shout box and let us know how you're doing. The center by itself with no rings on is 5 lb. pressure, then add one ring for 10 lb. The whole thing together is 1 5 lb. There are charts for canning fruits with the 5 lb. weight in case you need to know for later on. TY! to all who helped me figure it all out today!!! I've been out yard sale-ing and came across a box of lids and rings. Also in the box were some silver heavy lids with a white plastic feeling section in the center of the inside "dome". Can someone tell me what these lids are? There are some writing on the inside of some and I'll see what it says and let you know. I will take pictures and post them if that will help. I also found some REALLY old regular flat lids that have a grey colored ring on the inside edge instead of the red that I know. I'll take pictures of all of them so you all can see what I'm talking about. I bought a water bath canner yesterday and today I found a second one ( minus the rack) for only $5! So, now I can have 14 quarts going at one time if I want! I got my Ball Blue Book at Wal-Mart. Congrats on the yard sale find. I LOVE doing that. Those silver lids with the white thing are actually Zinc lids with a porcelain insert. They were used like normal lids, then screwed onto a jar with the rubber disc at the base of the jar's screw band. The thought was that by heating the rubber ring, working it over the jar's band and holding it in place with the lid, it would be air-tight. Ummm. NOooo. Often times food spoiled or air would leak in. As the 2-piece lid/ring system caught on, it eclipsed the zinc lids, clasp-top jars, and glass-top jars for safety reasons. They cannot be used nowadays for actual canning because they are unsafe. However, many antique lovers use them on blue or old jars because of the 'look' of being old. The porcelain insert assured the user that the zinc never came into contact with metal food. I've got a couple of blue jars sitting in my kitchen window that have macaroni and these zinc lids on top. My Gramma said that they were used in the 20's and 30's but fell out of use because they just didn't or wouldn't hold a seal well. Regarding the other lids, I've used lids that are older, up to 10 years old. The red adhesive is really old. They were using the brown/beige in the 80's. If you have any doubts, don't use them. Lids are cheap, around $1.25 / box. It's not worth the safety of your family and your hard work to lose jars of food over older lids. So, save them, use them as decoration, etc. I've got a couple of boxes I've saved for that purpose. The box did have a box of new wide mouth lids with the paper still on the bottom side of the flat lids, so I'm hoping that they're still usable? And has anyone heard of Atlas lids? Theres a small box of regular flat lids in there. VERY old looking box. Found a quart jar that apparently came from Michael's craft store. And the jar is for crafts, so I'm guessing that it couldn't take the heat from canning? I've never heard of paper being on the under-side of the lids before. Give one a whirl one night while you're cleaning up the kitchen with some applesauce or something. You'll know for sure then. If they don't work, you'll know without hosing a whole batch of something. I've attached a photo of the 'new' box that came out last year with the Kerr label from Jarden Home Brands. The red is the regular sized lids and green is wide mouth. And you're right - any 'craft' jar is just for that - to be used for crafts and NOT cooking or much less cooking in. Use it for a button collection or a give-away vase or something. This thread is old, but wanted to post...went Mennonite shopping today and found the half gallon tall Ball canning jars (I don't pressure can in them...only vacuum seal!) for less than 10$ for six. That's cheaper than any I've found...even at other Mennonite stores. Got myself two of them. I like to use them to store beans, rice, pasta, saltine crackers, cookies etc. They really keep foods tightly sealed and edible. I really like the half gallon canning jars. I use mine for sealing dried goods too. I noticed Wal-Mart has started selling them. I don't know how much they are though. Probably expensive. I noticed Ball is making some jars plain with no writing embossed on them at all. Mostly because of crafters. That's one of the reasons I like the Kerr jars. They have 3 sides blank. It's so hard to label a Ball jar. Are you talking about the LARGE jars, or regular pint/quart size jars. If they are being used mostly by crafters I would be concerned about using them for pressure canning - UNLESS it says specifically on the packaging that they ARE suitable for that use. I use the tall, half gallons. And no, they are not for canning. 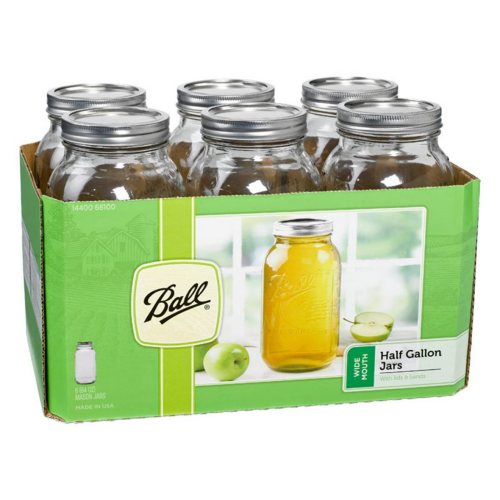 I don't think Ball even refers to them as "canning" jars...only jars. I use them only for dry good storage and vacuum seal. They're wonderful for pasta's, beans, rice, flour, corn meal, saltine crackers, cookies...they do a great job IF you vacuum seal them. Crafters use all sizes of Mason jars. It's kind of my style. The only thing I've ever heard of being canned in them is homemade grape juice, water bathed. Basically some grapes in the jar with water and I think sugar added. Personally I wouldn't do any canning in them. They are pretty tall for a canner and they hold a lot of food, especially for one person. But they are perfect for vacuum sealing food. Noodles, rice, crackers and cookies and about anything dry. One of them would be the equivalent of two quart jars. That's the way mine came packaged too We2. I do have one setting out on one of my end tables though. Inside it I have one preemie diaper, the first little 2 ounce bottle I ever fed him with, a little shoe, a pair of little socks, the first pacifier I ever gave him, the first spoon I ever fed him with, the first toy we ever played with, well you get the idea. Oh and my first little 'grandma' Christmas ornament. And the first little bitty McDonalds happy meal French fry package we ever got. Beside it I have a picture of him. Thankfully my son and D-I-L amused me. Sigh, that jar will follow me to the grave. I have a gallon one that sits on top of one of my book cases in the livingroom...inside of it is stuffed Alvin the chipmunk and his gal! A friend knows I love to watch the chipmunk movies so she got them for me one Christmas many years ago. Busted!!! !